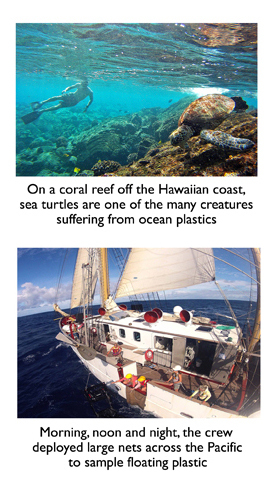 We’ve all heard of the so-called “Plastic Garbage Patch” in the Pacific Ocean. But what’s this Island of Plastic really all about? In the fall of 2012, the renowned adventurer and conservationist Jonathan Waterman decided to investigate. Setting out as the ship journalist from San Diego on a two-masted sailboat, he wrote dispatches for the National Geographic and learned the shocking truth about our plastic oceans. “Jon” tells the story of this 2,500-mile journey with breathtaking photographs and video, sharing stories about sea mammals, starry night skies that merged into bejeweled seas, and what it’s like to go without seeing land for over a month. 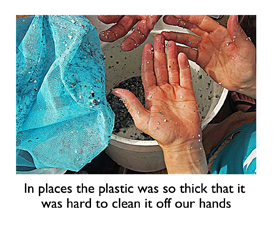 He worked round the clock with researchers and scientists from the Sea Education Association, as they deployed nets and counted over 72,000 tiny pieces of plastic, along with logging numerous pieces of Japanese tsunami debris. Jon’s lecture shows graphically and with first hand knowledge—through a rollicking sea adventure—the true extent of plastic pollution in the world’s oceans. In an upbeat and positive fashion, he shows how we can work our way out of this crisis and take steps as consumers. Preceding his evening lecture, the award-winning journalist (author of Northern Exposures: An Adventuring Career through Stories and Images) often visits classrooms to share advice and anecdotes about how one can make a living with a camera and a computer.